Ok, it wasn’t really a Minneapolis park project, but it still deserves a laugh: Minnehaha Creek converted into a 30-foot-wide power boat canal from Lake Minnetonka to Lake Harriet! Lake Harriet could have been more like Lake Minnetonka. The generally accepted solution to the lack of water over Minnehaha Falls was to divert Minnehaha Creek into Lake Amelia (Nokomis), drain Rice Lake (Hiawatha), dam the outlet of the creek from Amelia to create a reservoir, and release the impounded water as needed — perhaps 8 hours a day — to keep a pleasing flow over the falls. Unfortunately, with all the last-minute dredging and bridge-building for the Isles-Calhoun channel, that couldn’t be done in 1911 between April and July 4, when the Civic Celebration would launch. Into this superheated environment of waterways and self-promotion stepped Albert Graber, according to the Saturday Evening Tribune, May 28, 1911. With the backing of “members of the board of county commissioners, capitalists, attorneys and real estate dealers”, Graber proposed to dredge Minnehaha Creek into a canal 30-feet wide from Lake Minnetonka to Lake Harriet. This would provide not only a water superhighway from Minnetonka to Minneapolis, and boost real estate prices along the creek, but it would also create a much larger water flow in Minnehaha Creek, solving the embarrassment of no laughing water. Sure, there were problems. Not every plan could be perfect. The plan would require dismantling the dam at Gray’s Bay at the head of Minnehaha Creek, which might lower the level of Lake Minnetonka. But Graber and his backers had thought of that. The Minnesota River watershed in the area of St. Bonifacius and Waconia would be diverted into Lake Minnetonka — no problem! — which also solved another bother: it would reduce flooding on the Minnesota River. The dam at Gray’s Bay had been operated by Hennepin Country since 1897. Many people then and now consider the dam the cause of low water flow in Minnehaha Creek, but the earliest reference I can find to low water in the creek was in 1820, when the soldiers of Fort Snelling wanted to open a mill on Minnehaha Creek, but were forced to move to St. Anthony Falls due to low water. That was even before two intrepid teenagers from the fort discovered that the creek flowed out of a pretty big lake to the west. The Evening Tribune article concluded with an announcement that meetings of those interested in the project would be held in the near future with an eye to beginning work before the end of the summer. Graber noted that his inspection of the project had been, no surprise, “superficial”, but that he would make a thorough report soon to his backers. I can find no evidence that the idea progressed any further. 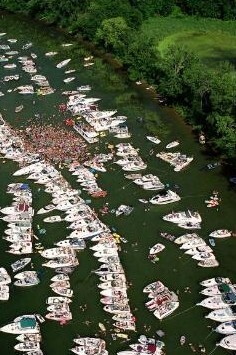 The Board of Park Commissioners would have had no role in the plan, except, perhaps, allowing power boats to enter and be anchored on Lake Harriet. (I think they would have said no.) Park board ownership of Minnehaha Creek west of Lake Harriet to Edina wasn’t proposed until 1919 and the deal wasn’t done until 1930.